Movie Review - 'The Lone Ranger' - In A Familiar Wild West, A New Perspective On A Storied Hero Johnny Depp and his Pirates of the Caribbean director, Gore Verbinski, have already made one Western: The animated film Rango. So with The Lone Ranger, they were looking to do something a little different. Critic Bob Mondello says you can say that again. A Familiar Wild West, But The Guy In The Mask? Who's He? There's never been anything very lone about the Lone Ranger. He's always been accompanied by Tonto, his Native American sidekick; Silver his snow-white steed; and the William Tell Overture. And in the big-screen version out this Wednesday from Johnny Depp and director Gore Verbinski, he's also trailed by a wagon train's worth of classic-movie references: Monument Valley settings straight out of John Ford Westerns, steam-locomotive stunts cribbed from Buster Keaton's The General, a one-legged madam who'd seem Alice in Wonderland-ish even if she weren't being played by Helena Bonham Carter. There are even antagonist-buddy routines for the lawman Ranger and the outlaw Indian that might have been lifted straight out of Laurel and Hardy. Armie Hammer plays the titular Ranger — well, Ranger-to-be when the film gets underway — as a noble do-gooder fresh out of law school, while Johnny Depp's Tonto is a face-painting "noble savage" (that's the movie's phrase) who's forever feeding the dead crow he wears on his head. They'll bond, but not until the movie introduces Silver — a spirit horse who arrives to lift the ranger's soul literally from the grave. Think of this film's early going as an origin-story version of The Lone Ranger, in which we even get a backstory for the mask. That, and some major shifts in tone. 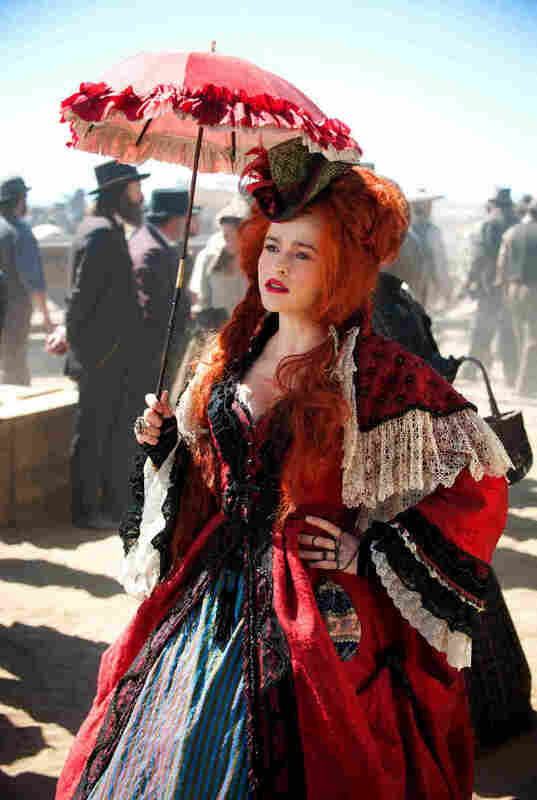 If Johnny Depp's in the film, can Helena Bonham Carter (and a bustier) be far behind? In this Ranger, she plays Red, the madam of a Texas brothel who offers aid and comfort to Tonto and his masked companion. Audiences expecting a Pirates of the Panhandle from Verbinski — who paired with Depp on that swashbuckling franchise as well as on the ingeniously eccentric animated Western Rango — are in for some serious dry stretches. The director's been saying his Lone Ranger is a sort of Don Quixote as seen through the eyes of a demented Sancho Panza, and as with that tale of a knight tilting at windmills, there's social commentary everywhere you look in this adventure. The script fancies itself a critique of capitalism, a manifesto on manifest destiny, and a saga about silver mines and the slaughter of Native Americans. All very admirable, if not a great fit for scenes that involve Depp communing with snaggle-toothed cannibal bunny rabbits and taking a runaway train ride or six. I mentioned Buster Keaton's train movie The General earlier, but when Keaton did stunts — playing pickup sticks with railway ties to clear the track in front of a moving locomotive, say — he actually did the stunts. The ties had weight. Here, the director laid six miles of track in New Mexico and built two locomotives — built the locomotives, I said, reportedly for authenticity's sake — so he could do things with real trains. But he's digitally enhanced and implausibly staged those sequences so thoroughly that he might as well have done the whole thing as a cartoon. There's a couple of hundred million dollars' worth of technical wizardry up there on screen, and nothing is at stake. Except, maybe, for some future amusement park ride, and the sequels, and toys and hats and masks. And piles and piles of silver, if enough people lay down their hard-earned dollars to hear Hammer's hearty "Hi-yo."